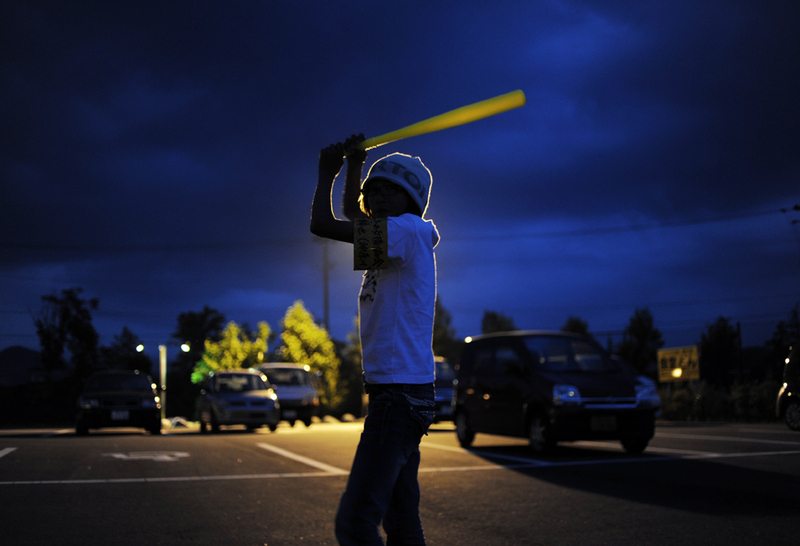 Rukiya Hara (12) impersonates a baseball player of Yomiuri Giants ,Alex Ramírez, at the parking lot of Ichinoseki, Iwate prefecture. Rukiya's favorite baseball team is the Softbank Hawks though, not the Tokyo Yomiuri Giants because the Softbank team is based in Fukuoka, Kyusyu, where he was born. He and his father, Takaki Hara (38) are on the way back home from the Tohoku region where the 3.11’s M9 earthquake and Tsunami devastated and the road trip of Takaki Hara’s NPO and personal mission. June 13, 2011.